The FIFA series has long reveled in its own pomp and circumstance. Awash in league licenses and Ultimate Team microtransaction money, its self-belief was arguably greater than its on-the-pitch accomplishments. That being said, EA Canada deserves recognition for continually working on the series, adding to an ever-growing and vital list of game modes and chipping away at its gameplay to-do list. FIFA 15 is the big pay-off you've been waiting for. It isn't perfect, but it's a quality title that finally aligns many of EA's ambitions with firm results. Make no mistake – this is a golazo. The title's crown jewel is its excellent gameplay. Players' possession of the ball feels a lot less pre-determined than in previous years. This goes well with the refined dribbling and defensive tackling, presenting a coordinated package that feels more organic and real, like you're playing by your own whims and not negotiating imposed constraints. Shirking off a challenge and retaining possession, or conversely winning the ball after a tackle and starting the counter attack happens fluidly. A foot race between two players for a free ball feels like a real contest, with physicality and unexpected ball baubles coming into play. Finally, there is freedom in FIFA. The ball behaves differently, which is no small matter, since it also produces a greater variety of goals. Realistic deflections change the complexion of play instantly, and often players are quick to react, sticking a leg or a hand (for keepers) out to get a piece of the ball. That being said, I'd still like to see A.I. players react more aggressively when you call them in defensive support, as well as have more awareness of their own teammates so there's less bunching and bumbling. 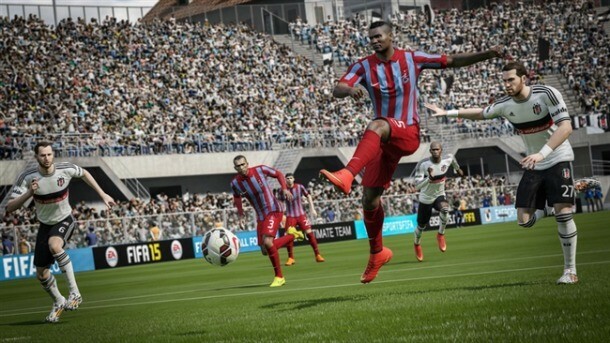 The improved gameplay is FIFA 15's most notable distinction. Conversely, the career mode has seen only small organizational improvements. The ability to set instructions for individual players (like telling a back to always overlap his runs) is great, but in general the career mode hasn't changed enough. Fatigue still isn't a factor (and there's no reserve system), international management has stagnated, and while more players are uncovered by your scouts, the transfer network still goes inexplicably dark at times. For a game that has such strong online modes, the lack of an online franchise mode is also surprising. A revamped career mode is preferable, but there is so much cumulative meat in the modes that you have plenty of flavors to feast on. The addition of friendly seasons (where you can compete against a friend to see who wins a 10-match mini season) to both the Ultimate Team and Seasons modes adds more riches. Tournaments are back, and Pro Clubs gets a boost with more effective A.I. teammates. Ultimate Team also adds loan players and the ability to prep speculative dream teams from the transfer market, but I'd like them to adopt the unified deck structure like Madden. This bounty is wrapped in stirring TV-style presentation that makes even the pause screen attractive. The commentary announces the sides' lineups, replays past goals, delivers more timely analysis, and even goes back to comments interrupted by the action. The new player emotion feature is surprisingly unremarkable, but I frankly don't care when the overall package is otherwise this good. The FIFA franchise has gone from a game that was huge because of the de facto effect of its numerous licenses to a title that stands tall thanks to its own abilities. FIFA 15 takes the series into a whole other level with gameplay that betters the surmounting hype that threatened to engulf it. Playing it makes me believe I can do just about anything with the ball at my feet, and this self-assurance is powerful. If you have the desire, FIFA 15 meets the challenge. It does not disappoint. The Xbox One and 360 editions of the game include more exclusive Legends players for Ultimate Team, including Roberto Carlos, Bobby Moore, and Alan Shearer.